Home Forum Desktop Products (Suite, Presenter, QuizMaker, Converter Pro, etc.) Technical Issues Where did the ability to add background music disappear to? Where did the ability to add background music disappear to? Posted: Fri Nov 13, 2015 11:43 pm Post subject: Where did the ability to add background music disappear to? So in iSpring Suite 7 have been able to add background music easily with the "Import Background Audio" button. There is no such button in version 8, and I don't see another way to do it. It seems insane that such a feature would be intentionally removed, so I assume it is hiding. Where is it? 2. Look at the top right corner. Here you can see Playlist button. 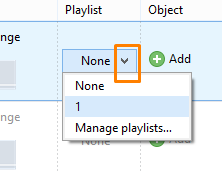 Open the drop-down menu and select Manage playlists. 3. Give the name to your playlist and add audio files, then click Close. 4. Select slides and choose this playlist in the drop-down menu for them. The name of the playlist will be shown in the Playlist column. Hope this information can be on use!